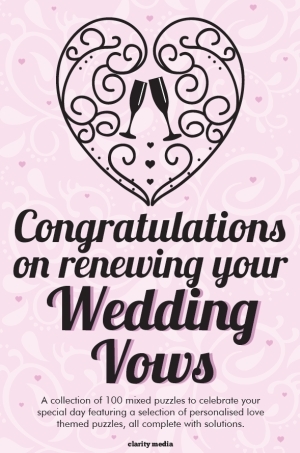 Welcome to the fantastic collection of 100 puzzles, created specifically for those celebrating their wedding vow renewal. Looking for a way to commemorate the day and give a unique gift that they are sure to appreciate? Look no further! Our puzzle books are the perfect thing to enjoy and solve together, or alone when you have a quiet moment. This book features 100 fun and unique puzzles such as the classic sudoku, wordwheel, crossword and even a selection of love themed 'find the word' puzzles! Can you find 'love, trust, together, devoted' and many other words among the grids? Each book contains 20 themed word search puzzles so it is not just the cover that makes this a personalised gift, as these 20 wordsearches are unique to this special occasion. 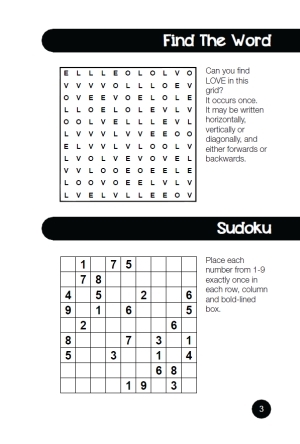 For instance, the words 'love, treasure, protect, respect, together, adore' and many others are hidden in the grids. Do you think you can tackle these tricky puzzles and solve them all? All puzzles are complete with solutions towards the back, so if you need a little inspiration or hint, take a look there!